As of Friday, I made it through another year making a living by doing comedy! 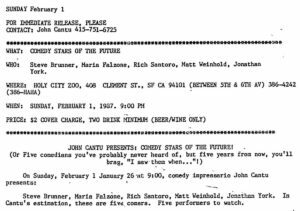 On February 1, 1987, I performed my first paid gig at the mighty/tiny San Francisco Comedy Club called the Holy City Zoo. Sixty-one people paid two bucks each and I got 10% of the door. Yes, my payday was $12.20 that night. Thanks to the gone-too-soon John Cantu, a show promoter who always had the biggest laugh in the back of the room. He told me that I could do this. John said if I kept improving, performing comedy as a living wasn’t outta the realm of reality. And then there’s fellow funny man Jim Farrell who thinks like three people all by himself. To this day, he is one of the best backboards to throw a joke at. It’s been 32 years, 50+ countries, 49 states* and thousands of people in audiences, plus friends in the business—and outside the business. I hope I don’t take any of them, or the gift of creativity, nor a single shred of laughter for granted. I don’t know if I’ll be onstage 32 years from now, but I’ll take what I can get. Thanks, laughter, you’re about my favorite sound. Here’s to hearing more! * I will take any gig in South Dakota! Call 818/762-3068.